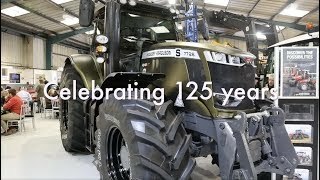 Customers had the opportunity to join in John Deere tractors’ 100th anniversary celebrations at a series of open evenings arranged by main dealer Doubleday. David Williams was there. Doubleday has three branches from which it serves customers in Lincolnshire and parts of Norfolk and Cambs. The open evenings were held in mid-May at the Swineshead and Holbeach, Lincs and King’s Lynn, Norfolk depots. On display were the latest John Deere tractors, sprayers and combines, contrasted by a line-up of tractors from each decade back to the 1960s, several from the dealer’s own collection. These included a 1964 John Deere 5010 – boasting more than 100hp and used on a local farm, a 1975 2130, a 1984 2140 sold new by John Doubleday, and a 1991 2650. John Doubleday started trading in 1974 selling Ford tractors, but in 1982 he was appointed a John Deere main dealer. Trading as John W Doubleday the business grew to cover a larger trading area adding branches and, now trading as Doubleday, represents key franchises including Vaderstad, Gregoire Besson, Bomford Turner, Maschio, KRM, Cherry Products, Lynx Engineering and Cousins, and last year took on the Kramer handler franchise. The Doubleday team enjoyed a series of three busy open evenings. Pictured above (l-r) Mark Goose; Richard Wales; Paula Scrupps; Adam Langley; David Kreutzberger; Alex Child; Zoe Chappell; Luke Spencer; Dan Parker; Andy Webb; Jon Baxter and Richard Hook. JD Link is John Deere’s telematics system allowing the dealer and farm office to link wirelessly to the tractor for the transmission of machine and task information. “We use it a lot for remote diagnosis,” said Richard, “and it saves a great deal of time which would otherwise be spent travelling out to machines in the field when issues can be solved remotely in minutes. “Our service department is alerted when services are due and any issues are automatically reported so the engineer knows exactly what needs doing, and which tools and what parts are needed. If machines are in the field the engineer can see their position on his screen which saves time explaining their location. Updated software is often sent wirelessly now, whereas previously this would have required a visit with a laptop to plug in. If a user needs help setting up the tractor or an implement, Remote Display Access allows the engineer at the depot to link in to the tractor screen and see exactly what the user is seeing, and talk through the set-up procedures. “Most customers are specifying JD Link now, and benefitting from time savings and increased productivity,” he added. Within its machinery fleet the farm has 5 John Deere tractors; a 6430 bought second-hand, and a 6910, a 6920S, a 6215R and an 8345R. The telehandler is a John Deere 3420 and the combine is a T670i, the third John Deere operated, and shared with a neighbour. JD Link is used and the farm has two sets of Greenstar GPS auto-steer equipment through 2630 displays transferred between tractors. “John Deere machinery provides great ease of operation and swapping between the tractors everyone knows immediately what everything does,” he explained. “Daily checks are carried out in just a few minutes and we do routine servicing in-house, with major services by Doubleday. John Deere is a very strong brand in our local area which is indicative of the quality of the product, and the strength of the dealer in terms of back-up and reliability.” Paul is pictured with Doubleday area sales representative Dan Parker. A demonstration by Bridgestone explained benefits of correctly inflated high performance VF tyres. A John Deere tractor was equipped with a pair of 650/65R38s; one a first generation version and the other the latest third generation VF type. Both were inflated to the recommended pressures for the tractor, plus a 3t rear linkage load to travel at 50kph; 19psi for the standard tyre and 11psi for the VF version. The tractor was then driven over a mould tray so the footprints could be compared. VT tyre sales manager Steve Lamb explained that for every tyre revolution there was a 42 per cent reduction in ground pressure due to the VF’s lighter footprint through its ability to spread the weight over a larger contact area. “An arable farmer’s most valuable asset is his soil,” he said. 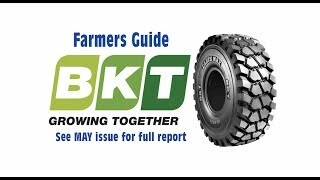 “We have been working with Doubleday during the past year raising awareness of the benefits of VF tyres and offering a service for users where we attend the farm equipped with weighpads, and weigh the tractors with different implements to ascertain the minimum possible working pressures for each task.